I got the recently published The Vegan Table, by Colleen Patrick-Goudreau, and it looks terrific (with lots of gorgeous photos!). It's for entertaining, and is set up differently - divided into sections by everything from romantic dinners for two to cooking for a crowd, and within each section she's made menus by season. But it's still easy to find everything with a good index and a list of recipes within each section. It's got everything from tofu burgers to canapes to holiday menus, so there's a range of dishes from easy and informal to fancier fare. I've made two dishes so far and have liked both. My only complaint is that a pie recipe said to either buy a crust from the store or to make it from scratch using her recipe in The Joy of Vegan Baking. (I don't bake much, so I don't own it.) Veganomicon, for example, never refers you to VWAV for the recipe for part of a dish. But other than that, I'm really happy with it. Hey, thanks for the heads up! That looks like a good book. I do like her The Joy of Vegan Baking book, which I purchased recently. Damn, I'm such a cookbook whore! The thing I do find about vegan cookbooks is that no 2 are the same. You might have the same names for recipes, or you do get a recipe for guacamole and hoummous in a lot of them, but they are all so different! "You're right, Jackie. The Fonz could beat up Bruce Lee." Damn, I'm such a cookbook whore! I love the way this book is set up. Like Jessica said, the author lays out menus by themes and by seasons. The photographs and colors are beautiful too. I know some don't really care about that, but being a fan of cookbooks in general, I really like those details. I have only made 4 recipes so far. One was pretty intense with the raw garlic (Sundried Tomato & Walnut Pesto). Next time, I'll just reduce the garlic a bit. A lot! I LOVE the Zucchini cake recipe. I did have to tweak the recipe. I felt it was too heavy on the seasonings, but it could be that I didn't measure my shredded veggies correctly. Once I played with it though, it worked beautifully. I now have an excellent substitute for crab cakes. Even my omni SO said they were fantastic. Her chocolate chip cookies were good. Again, I messed with the recipe and managed to create a copy my MIL's omni recipe, but the author's recipe stands alone nicely. The brownies were a big hit! Very chocolately and dense. I'll share more as I move through the book. ^Wow, first I've heard of this book! It sounds great. I have her other one, it was a gift from my MIL. SIA, are the zucchini cakes a stand in for crab cakes? Or is there a recipe for "crab cakes"? That's something I am always looking to veganize. No, there is no crab cake recipe. But I tell ya...the zucchini cakes are a fantastic substitute. My SO loves my old crab cake recipe, and when I made the zucchini ones, he was extremely impressed (he even asked me to use this recipe with crab.... ...okay, that's a step in the wrong direction, honey). They even fry up and look like crab cakes. You can play with the seasonings until you get it just right too, so if you like dill or anything else in a traditional crab cake recipe, you can use it with the zucchini cakes. I added vegan worcestershire sauce and some shredded carrot. Watch your veggie to Old Bay Seasoning ratio though. Heh. I used the 1 tsp. of OBS with what I thought was 2.5 cups of shredded zucchini, and the OBS was overpowering. Start with 1/4 tsp. and go from there. ** I should issue a general garlic warning with this book though. I think the author really, really likes garlic and doesn't mind the after effects. After eating the pesto I mentioned earlier, I was told I reeked of garlic. Thanks so much for the info. Those zucchini cakes sound wonderful. I never measure my OBS , I kind of just shake it in and hope the ratio is good. I'll try to keep a closer eye on it in this recipe . The dill, shredded carrot, and worcestershire sauce all sound like great ideas. Thanks again . I've put the book in my Amazon cart. I LOVE her book - highly recommended! I've made the tofu scramble, sloppy joes (but with seitan instead of tempeh)...very delicious. I only bought it on Monday so I am extremely excited to go grocery shopping this weekend. Alrighty - so, I have been making numerous dishes from this book and it only gets better! I actually cannot recall exactly which meals I have made, since there have been so many - but all I can say is that with this book, you won't need to buy another cookbook for a LONG time. I guess this goes without saying, but for the recipes that look awesome and are under the "4, 6, 8, 10+" sections I simply scale WAAAAY down for my fiance and I. It works out great. I have also purchased the Veganomonicon (spelling??? ), The Vegetarian Express, The Vegan Lunch Box, The Complete Vegan Kitchen and the Joy of Vegan Baking. 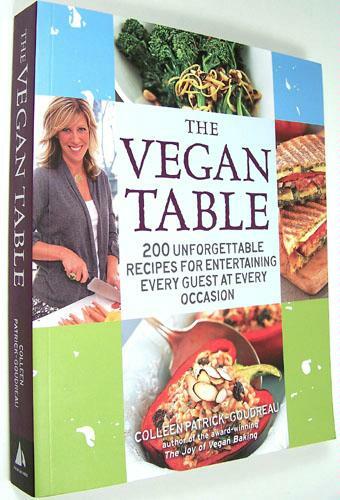 This is my personal opinion but the Vegan Table dominates all these other cookbooks. It recipes are wonderfully informative, easy to read and just plain old YUMMY! Actually, The Joy of Vegan Baking (which is also by Colleen) is absolutely excellent! Last edited by jasminschade; Nov 2nd, 2009 at 07:51 PM. Reason: Updates! I have an ebook of this. It is a really nice book, full of colour and little sidenotes about ingredients and veganism in general. Anyone who listens to the Vegetarian Food for Thought podcast will recognise her quotes and literary references. I haven't made anything from it but the food looks really nice. There is a nice range of formal and casual recipes, ordered depending on the type of gathering (ie intimate meal for two or finger-food buffet). She likes Italian food and there is alot of it in there but she also dips into lots of other cuisines. It struck me as the type of book I would use for recipes if I were to go on 'Come Dine With Me'! There are also some kosher recipes specifically for vegan Jewish celebrations which I thought was an interesting touch.